Several months ago, Starbucks opened up use of its bathrooms to customers and non-customers alike. Although that policy stressed “no sleeping, no drugs,” it seems that not everyone who uses the Starbucks bathrooms is on board with the latter. So much so that employees have been afraid of getting pricked by discarded syringes and needles in garbage cans and sticking out of trash bags, leading to possible health risks. In response, Business Insider reports that “3,700 people signed a petition on Coworker.org, calling for Starbucks to place needle-disposal boxes in high-risk bathrooms.” Those high-risk places include urban areas like Seattle and Minneapolis. Besides needle-disposal boxes, Starbucks is investigating options such as thicker trash bags, as well as removing trash cans from some bathrooms altogether. 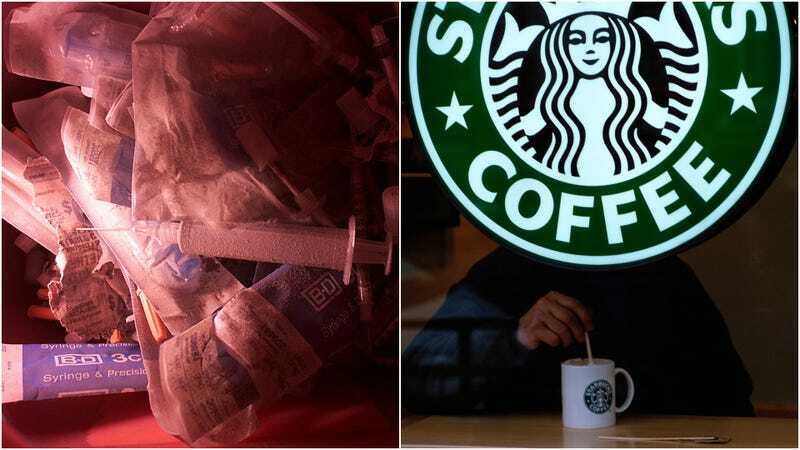 Although Starbucks employee training includes how to dispose of a hypodermic needle, anonymous employees expressed to BI their concerns over unsafe items they encounter at work. Said one, “My primary fear when I worked there would be taking out the bathroom garbages… I was terrified that if I went to take the bag out, I would get poked by a needle I didn’t know was there.” Another employee in Minnesota report encountering “drugs, alcohol bottles, blood on floors and walls, condoms and condom wrappers, and needles (capped and uncapped) on floors and in the trash” (and provided pictures).